More than 1,000 people turned out on Wednesday to pay respects to the Last of the Mohicans star, American Indian activist Russell Means, in an impressive 12-hour service in South Dakota. The moving memorial featured a tribute in his native Lakota and was delivered against the backdrop of the barren prairie land where he was born. As family members rode horseback down the Big Foot Trail in the Pine Ridge Reservation, they sang in honor of Russell Means who passed away on Monday. Russell Means died at his home in South Dakota after spending decades fighting for American Indian rights, starting with protests against college and professional sports teams’ use of Indian images as mascots. He later become the leader of the American Indian Movement (AIM) and a Libertarian Party candidate for U.S. president. Russell Means, who was 72, had been battling advanced esophageal cancer. Bill Means said on Wednesday that his older brother’s combative nature and unwillingness to accept any form of racial discrimination was ingrained at an early age. “Our mother had faced discrimination throughout her life, and she was a not a woman to compromise – particularly when it came to discrimination,” he said during the service. 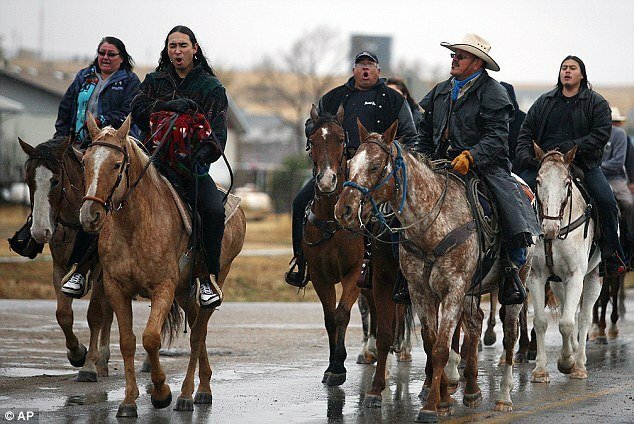 The ceremony was expected to last 12 hours, beginning with a funeral procession led by 21 horses through a stretch of the Pine Ridge Indian Reservation of the Oglala Sioux in South Dakota, where Russell Means was born.